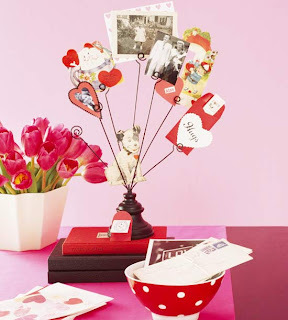 Express your affection by creating these simple handmade gifts and decorations for Valentine's Day. From heart-shape art to pretty Valentine's Day decor for your mantel, these crafts and projects will be loved this holiday. Bright colors make this Valentine's Day mantel pop -- traditional pink hearts mix with bright orange, yellow, green, and blue patterned fabric on the banner.Trace 16 hearts onto pink houndstooth fabric and cut them out. 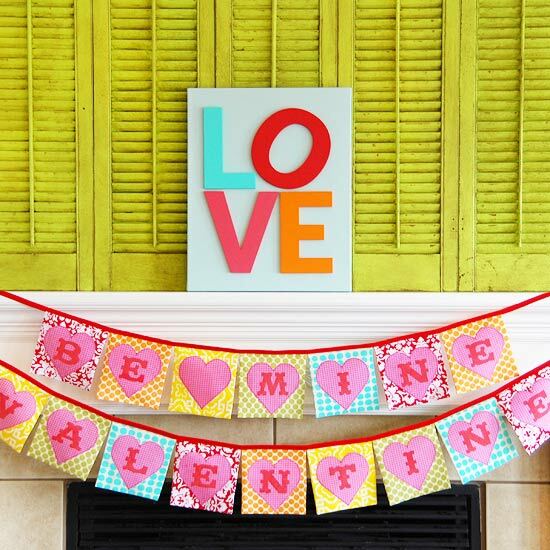 Use a stencil to paint letters onto the hearts to spell out a sweet phrase (like "Be Mine Valentine"). Sew the hearts onto colored fabric squares with fun patterns, attach the squares to red ribbon, and hang across a mantel. A wreath covered with paper curls bursts with Valentine's Day color and spirit. 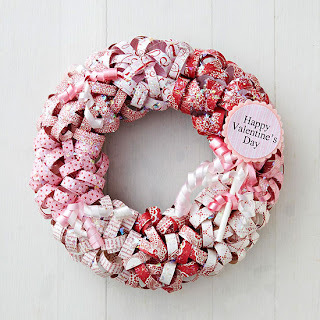 Lovely over a mantel or on a door, this valentine wreath is easy to construct.Tightly wrap 1x6-inch strips of patterned paper around a pencil to curl. Glue the end of each curl into a loop. Hot-glue the paper to an 8-inch foam wreath form. Repeat until the form is covered. Lightly brush liquid adhesive over the paper curls, and sprinkle with glitter. Print a Valentine's Day sentiment on patterned paper, back it with a felt circle, and add a white stick for a paper lollipop embellishment. Create a flower bouquet that could last almost as long as your love. These crepe-paper flowers bloom in valentine colors for a centerpiece that will make you swoon.Cut a 20-inch strip of crepe paper. Cut petal shapes along the top of the strip (such as large rounded or pointed petals or fringe). Leave about 1 inch at the bottom so the strip won't tear. Adhere a chenille stem or piece of florist's wire at one end of the paper strip. 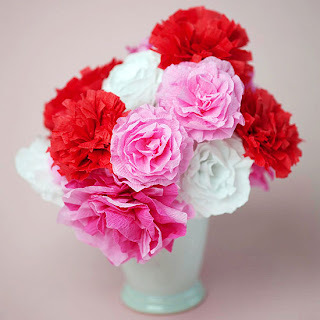 Roll the crepe-paper strip around the stem or wire, fluffing and shaping the petals as you go. Secure the end with florist's tape, and arrange the bouquet. Tug on heartstrings with a garland of oversize stamped hearts. 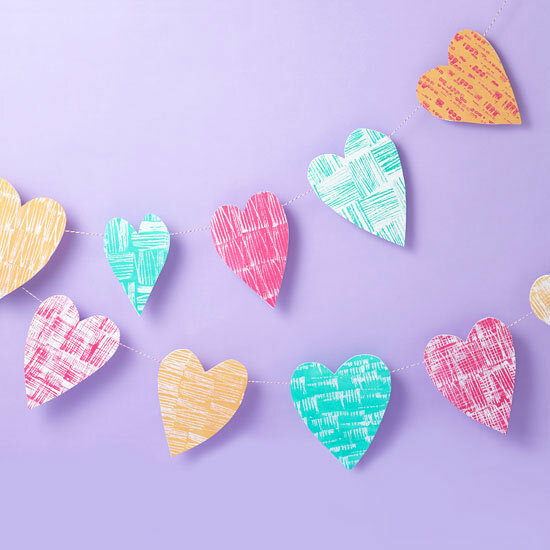 These colorful hearts are so easy that even kids can help.Wrap twine around a wooden cube, then apply a thin layer of paint to one side. Stamp onto white or solid-color cardstock, using the image for inspiration; let dry. Repeat with additional cardstock and colors. Cut the cardstock into large hearts. (Use a pattern for consistency or cut freehand for eclectic variety.) 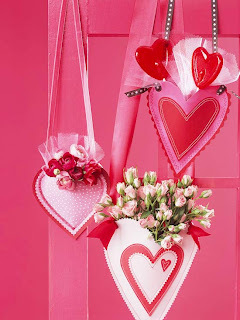 Use tape or glue to attach the hearts to a length of string, and hang the garland. Personalize these cute crafts projects to make themed shelf decorations for Valentine's Day.To craft the collage, cut out repeating shapes from fabric (we used birds and hearts in various sizes) and use spray adhesive to mount on white cardstock; frame. 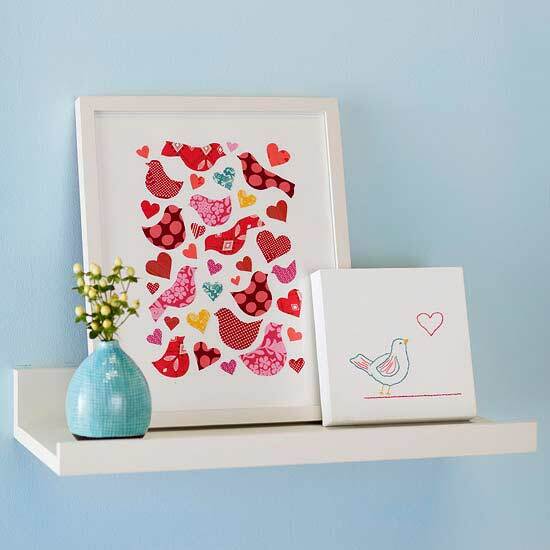 For more advanced crafters, design a work of Valentine art. Pencil a design on a store-bought canvas, then sew over your drawing using a thick needle (we used a backstitch technique). Spread a little love with this pillow. Dress up a plain throw pillow for Valentine's Day. 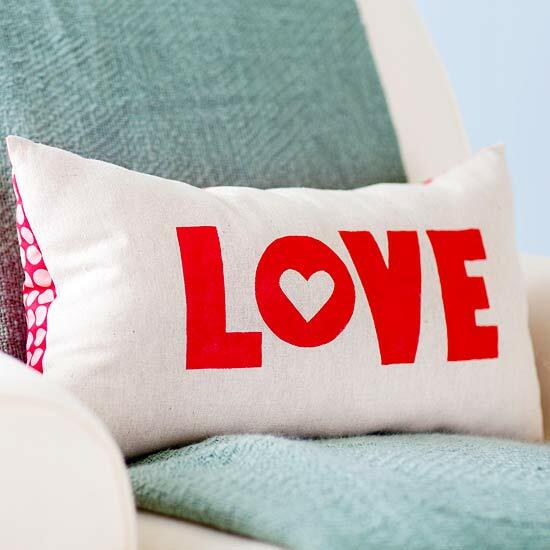 Add the word "love" with stencils and fabric paint. Cut out your own letters or buy a set of stencils, available at crafts stores, for a quick design. Tip: Alternate colors for each letter or use a different word on the pillow to make the design your own. Cozy charm spills from this Valentine's Day accent. The easy plaque comes together quickly with only a few supplies.Spray-paint a heart-shape wooden plaque a neutral color. Punch various-size circles from patterned paper, and glue them to the tops of vintage or crafts-store wooden spools in various sizes. Adhere the spools to the plaque, placing the tallest at the top and working to the shortest at the bottom. Wrap short lengths of thin wooden dowels with patterned paper. 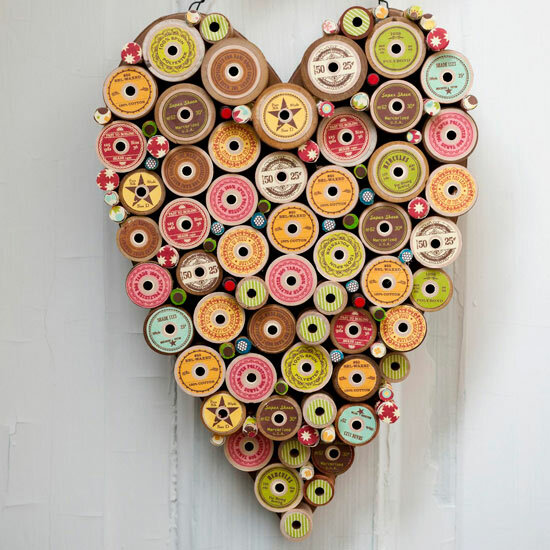 Fill the spaces between spools with the embellished dowels. Let your valentine passions burn brightly. Cut strips of pink patterned papers and adhere them to same-size strips of white cardstock. Die-cut, punch, or freehand-cut two sizes of hearts from the strips. Poke holes in some of the hearts. Run wire through the holes and wrap wire around the other hearts -- twisting and bending the wire into curls and loops -- to join the hearts. If you wish, slide beads onto the wire as you go. 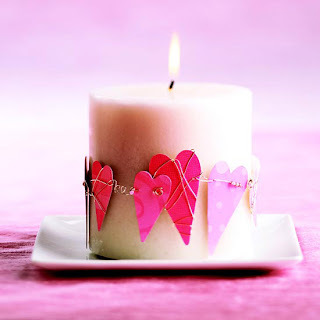 Continue until the wired hearts encircle the candle; join the wire ends to secure. 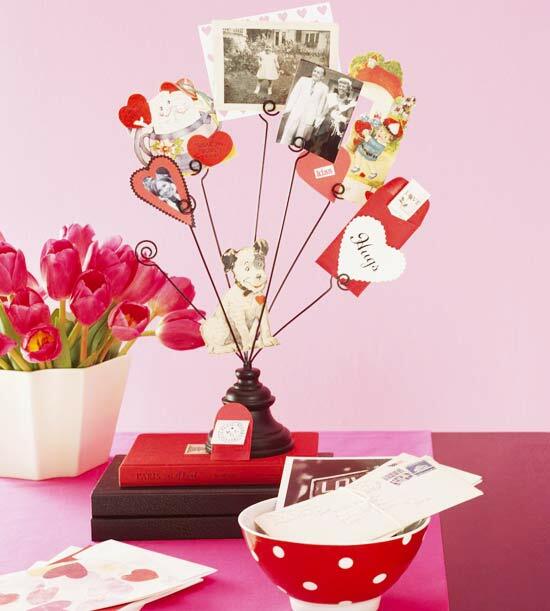 Highlight those you love with snapshots and valentines in a three-dimensional display.Gather favorite photos and make black-and-white or sepia copies. Paste some of the copies onto decorative papers and cut into fun shapes. Tuck them in a photo tree. Treat your valentine with a pouch of treasures, whether it's a cluster of posies or a handful of candy.Trace two same-size heart shapes onto pretty paper or cardstock; cut out. Cut more hearts in graduated sizes from contrasting paper, and use spray adhesive or a simple running stitch to attach to the front of the pouch. Stack the two main hearts with wrong sides together. Starting at one side near the top, use a sewing machine to zigzag-stitch around the edge, leaving top open; trim edges. Punch holes near top of pouch. Thread ribbons through and knot to secure.